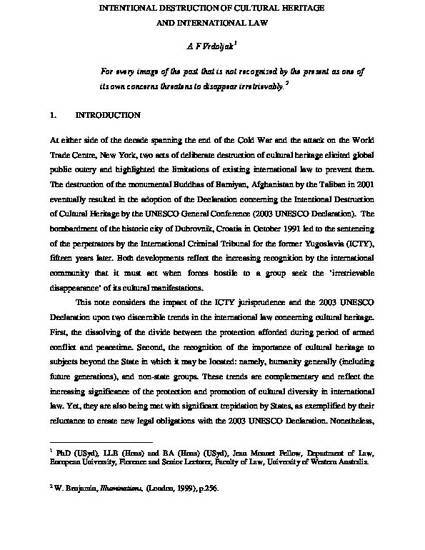 This note considers the impact of the ICTY jurisprudence and the 2003 UNESCO Declaration upon two discernible trends in the international law concerning cultural heritage. First, the dissolving of the divide between the protection afforded during period of armed conflict and peacetime. Second, the recognition of the importance of cultural heritage to subjects beyond the State in which it may be located: namely, humanity generally (including future generations), and non-state groups. These trends are complementary and reflect the increasing significance of the protection and promotion of cultural diversity in international law. Yet, they are also being met with significant trepidation by States, as exemplified by their reluctance to create new legal obligations with the 2003 UNESCO Declaration. Nonetheless, the events which triggered these developments highlight that the stakes are significant because the consequences of such acts are often irreversible.